We have developed this online application section for your convenience. With as busy as people are nowadays, our goal is to save you time. Here you can use our online form to get a quick and accurate response about financing your next vehicle. 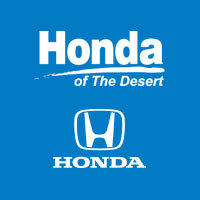 Whether you are considering a lease or a purchase, Honda of the Desert can tailor financing to meet your specific needs. You may be wondering if it safe to apply online. We use a super safe digitally encrypted format that is never sent via electronic mail so you can be rest assured your information is secure. If you would prefer to speak directly with one of our internet managers, feel free to call us at (760)-904-6852 and ask for Jared, Juan, or Mark. We look forward to assisting you with your next automobile purchase.